What Happens If I Put Raw Gas in a Chainsaw? Chainsaw engines require a premixed fuel to keep them running at the proper temperatures. The oil that's added to the fuel lubricates the piston and crankshaft, but it also keeps the engine cool enough to keep running. Without this oil in the gasoline, the piston will seize and the engine will be ruined. 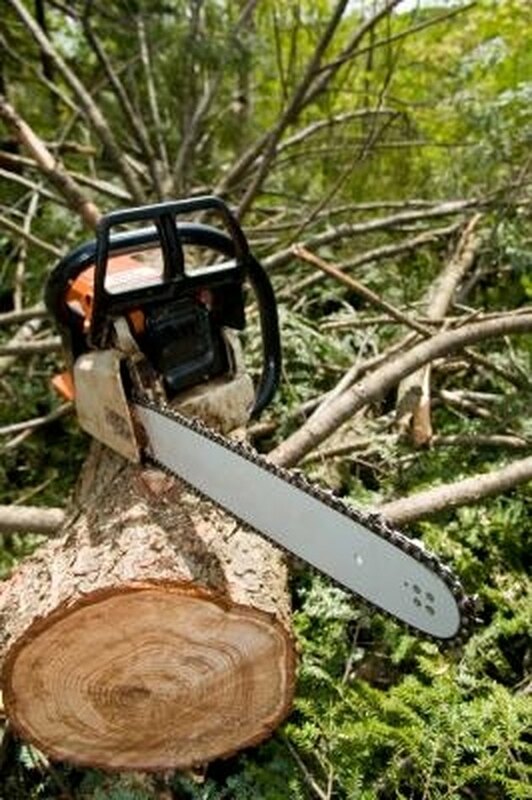 Nearly all gas chainsaws require a gasoline and oil mixture for their fuel. With the regular mixed fuel, the oil keeps the piston lubricated inside the cylinder. The piston moves up and down at incredibly high rates of speed. The crankshaft also turns at these same speeds. This high rate of speed causes enormous friction to build and heat up these engine parts. The oil, however, keeps these parts just cool enough to keep running. If no oil is present in the gas, the fuel will still ignite and power the piston and crankcase. However, the fuel will burn at higher temperatures, resulting in piston failure. Without the oil to keep the fuel from burning at a high temperature, the piston will seize up. The metal on the cylinder and the piston will heat and expand to the point where the piston no longer fluidly moves up and down inside the cylinder. This will cause friction inside the cylinder, eventually causing the piston to freeze up or stop moving completely. This will also cause the crankcase to stop turning underneath the piston. When the crankcase stops moving, all other systems shut down instantly. Most often, if straight gas is burned inside the engine, the engine is ruined. Little, if nothing, can be done to fix this error. The seized piston can't move, and the crankcase can't turn. While the piston and cylinder may be able to be removed and replaced, it is usually unlikely, as the metal will have heated up and burned out all other parts within the piston and crankcase. These systems are difficult to reach and costly to fix. Often, a new chainsaw will cost less than trying to fix the seized piston, which may not even guarantee it will work again. If you've put straight gas in the fuel tank, don't start the engine. If straight gas is used, it can damage and ruin the piston and crankcase within a minute, as the gas doesn't take long to burn out these sensitive parts. Drain the tank immediately into a separate fuel container. Pour approximately 1 tsp. of clean water into the tank, swirl it around and dump it out. Change the fuel lines and, if possible, remove the carburetor and clean it to prevent any unmixed gas from entering the cylinder.